Today I'd like to think about what it means to be the servant of the Lord. A quick search for Bible verses about 'servants of the Lord' will give you a myriad of results. Scrolling briefly through those results is so interesting. You find many verses you'd never noticed before that describe one of the heroic characters of the Bible as servants of the Lord. "'I am the Lord's servant,' Mary answered. 'May your word to me be fulfilled.' Then the angel left her" (Luke 1:38). "When Israel saw the great power which the LORD had used against the Egyptians, the people feared the LORD, and they believed in the LORD and in His servant Moses" (Exodus 13:1). However, one thing I love is that it's not only the Biblical people who are described as servants of the Lord. It's us, too! "Instead, in every way we demonstrate that we are God's servants by tremendous endurance in the midst of difficulties, hardships, and calamities" (2 Corinthians 6:4 ISV). "Praise the LORD! Praise, O servants of the LORD, Praise the name of the LORD" (Psalm 113:1). 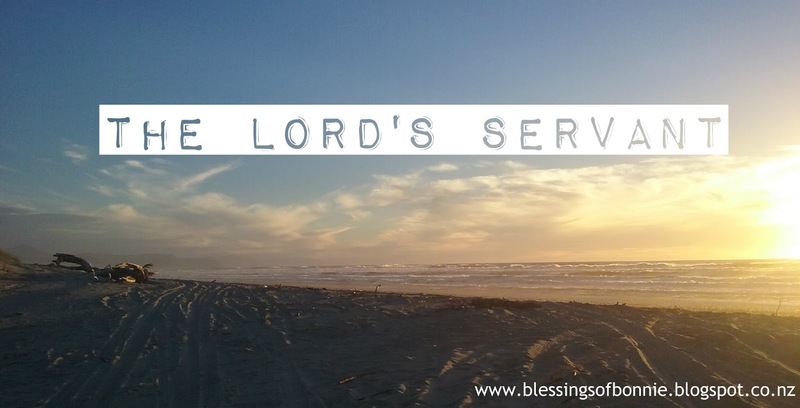 But why does the Bible refer to us as servants of the Lord? Aren't we meant to be princesses and princes of the King, as we are so often told? Identity is something a lot of people struggle with. Who am I? Why am I here? What is my place, my position in society? We Christians know that we are royalty. We have bookmarks saying things like, "daughter of the Most High King". Which is (don't get me wrong!) absolutely and completely true. But where are the bookmarks saying, "servant of the Lord" and "the Lord's handmaiden"? Where is the humility of our position contrasted with the majesty of our position? Where, in Christian society, are we told that we are servants of the Lord? The Bible heroes were celebrated not, I believe, because they were sons and daughters of the King... but because they were servants of the King. What is a servant? It's someone who does his master's bidding. It's someone who works for another and is at another's beck and call. It's someone whose role in life is to serve and do the will of somebody else. I think the prophet Isaiah got this, alright. He understood. "Then I heard the voice of the Lord saying, 'Whom shall I send? And who will go for us?' And I said, 'Here am I. Send me!'" (Isaiah 6:8). There he is, saying to God, "Here am I! Send me!" That's a servant attitude if I ever saw one. Now, don't get all upset with me and tell me how I'm going to make people all depressed because they don't know their true worth and their intrinsic value and purpose as a child of the King. That is all completely true. We are royalty. But don't get all excited about that if you're going to miss the also important thing that we are servants. Some translations even put it as 'bondslaves'. That's not just an average servant. That's a slave! I think the reason I wanted to talk about this is because it is so easy to become so fixated on one important point that you completely miss other important points. The thing about being a servant is that your will is not your own. Your desire is to serve another. You live to do the will of another. You have a much more humble position and a more humble attitude. So that the world can see You. Be blessed today as you joyfully serve the Lord! What a good post Bonnie. How has your life been going with study and your job? Life has been good... quite hectic but hey at least it keeps me out of mischief! :P I am finding myself quite looking forward to the weekends. But I am enjoying my job. I'm going to do a post on it at some point in the future. Oh yes sometimes it is harder to remember those hard facts, but of course being a servant can be such a blessing to and it is meant to be. Great reminder Bonnie. Thank you, Clare. I'm so glad it was a helpful reminder for you. Blessings!